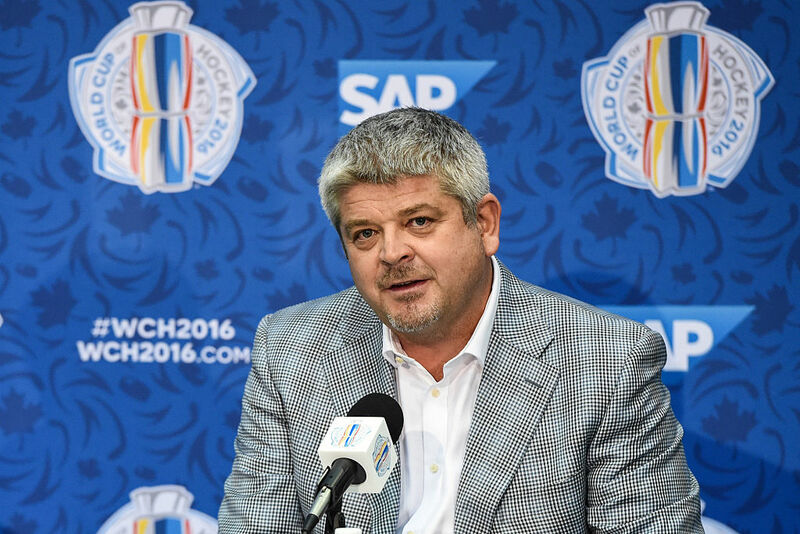 Todd McLellan never really got to the point of choosing between Buffalo and Los Angeles (Getty Images). It seems that Jason Botterill never got to the offer stage with Todd McLellan to quickly wrap up the Sabres coaching search. Whether their chats actually got to that point or not, McLellan's Buffalo-or-Los-Angeles dilemma gave another window into the Sabres' continued recruiting issues after years of losing hockey. If you're a coaching candidate or free agent, the Sabres will overpay you to get you to come or hope you'll come (See Kyle Okposo and Mike Babcock). Players rave about how ownership takes care of them and their families while they're here as well. Housing and schools in the area are well thought of compared to other NHL cities. But when it comes to hockey -- which is really the whole point -- what can the Sabres offer? Winning? Of course not. Longest playoff drought in the NHL now. You'll hear that more than a few times in the next year, or until whenever it finally ends. The Bills got sick of it but they had to own all 18 years, just like the Sabres will have to own every bit since 2011 even though none of them have lived through it all. Competition? In the case of McLellan, even with Los Angeles' weaker-looking roster, a turnaround is a much easier path in the Pacific Division than in the Atlantic. Especially now that Joel Quenneville is in Florida. If you're picking the 2019-20 Atlantic right now, prior to any offseason moves, the Sabres are no better than the No. 6 choice and perhaps even No. 7. Stability? If you're a coaching candidate, how interested are you in a job where the general manager might be on a very hot seat if next year goes badly? Likewise, how much does it give you pause to think there's been four coaches here in six years and ownership has an itchy trigger finger? Player core? Rasmus Dahlin is obviously a great building block to start with but Jack Eichel, Sam Reinhart and Rasmus Ristolainen aren't nearly the attraction they once were now that they've gone through four losing seasons together and the team has fired two coaches as a result. Still, most veteran coaches will probably carry with them the hubris that they can be the one to get Eichel to that 100-point level. Eichel's fifth year might be an excellent time for a new man to jump on board. Prospect pool? One big plus. Botterill's two drafts to date look like they're filled with possibilities beyond Dahlin and Casey Mittelstadt. How fast can Ukko-Pekka Luukkonen get here? And Tim Murray left behind Alexander Nylander, Rasmus Asplund, Casey Fitzgerald, Will Borgen and Victor Olofsson. Not bad at all. Atmosphere? KeyBank Center is one sour place right now because fan patience has nearly expired. Visiting teams started to openly talk in the second half of the season about jumping on the Sabres early in games as a way to get the fans to quickly turn on them. At best, this coaching job is a mixed bag. A veteran head coach, which seems to be the objective, is going to want to be paid. If you're thinking about Alain Vigneault for the Sabres, he reportedly made $4 million in New York. That's the same figure Barry Trotz is getting on Long Island and that's the ballpark the Sabres are in for a coach. Money talks but there's still a lot of convincing to be done. Former Edmonton coach Ralph Krueger stepped down Friday as chairman of the Southampton Football Club of the English Premier League. Krueger, 60, jumped back into the hockey limelight as head coach of the Team Europe squad that made the finals of the 2016 World Cup. You wonder if this is the first step to him coming back to the NHL. Botterill checked in with him during the Sabres' coach search two years ago but Krueger has indicated he's not that interested in coaching anymore, which puts him square on the radar for a president of hockey operations. The Sabres and Edmonton, both of whom could desperately use such a person, don't seem interested in the position. That could leave Ottawa, which has already gone on record as saying it would hire a hockey czar over GM Pierre Dorion. "You can never say never about coaching, but I really enjoy the growth of actually being in a role where you hire the best possible people, so that everybody you bring into an organization is actually better than you at what they do,’’ Krueger told Pierre LeBrun of the Athletic earlier this month. “That kind of became my goal here in Southampton. I think just the driving of a culture in a professional sports organization has become really my new passion and I could see bringing that back into North America someday. The Sabres should be picking up the phone right now but it seems clear they've decided not to go this route. Kim Pegula can stay as president of the Bills, where she's going to need to focus the bulk of her energy anyway as the franchise wades through its stadium dilemma. And frankly, it's absurd for one person to be president of both teams. Didn't work with Russ Brandon, won't work with Pegula, probably won't work with anybody. At a crisis point in their history, the Sabres need a hockey person in their president's seat to advise their reeling first-time GM. But they're going to stubbornly stick to the status quo. Opportunity lost. One reason it's so imperative for the Sabres to make the playoffs is because it's such a different game. And Buffalo's key core pieces have never gotten there to experience it. I'm reminded of what outgoing Edmonton coach Ken Hitchcock said when he was here last month when asked about how physicality translates to the postseason. "All the teams that are playoff teams check really well," Hitchcock said. "They're just relentless on it. You look especially out West in the Pacific Division, those teams doing really well check to death and then let their skill take over. "You have to have a maturity in your game. Maturity is checking and man, it's hard to do. It's really hard to do. You need a certain level of maturity and it's based on the disposition of your hockey club. And if you have that, then you can win for a long, long time. "That's what everybody is trying to incorporate. We all see the teams that do it and do it well, but man, it requires an unbelievable amount of focus and effort to do that and we're all trying to get there." The big edge to having home-ice advantage is getting to host Game 7 of a series. Seeing the fan and/or media panic in places like Tampa Bay, Boston and Winnipeg after those teams were upended in Game 1 at home on Wednesday and Thursday hearkened me back to Lindy Ruff's views back in the day when the Sabres were actually part of the playoffs. Ruff was never a big fan of opening a series at home because there's huge pressure on your team to win that first game. Lose it, and the pressure really builds to not fall behind, 2-0, before heading out on the road. That's where the Jets and Lightning now stand and what the Bruins were trying to avoid Saturday night. Conversely, Ruff always liked the idea of trying to earn a split on the road in the first two games. And even if you didn't, coming down in a 2-0 hole wasn't the worst thing because you simply needed to hold serve in Games 3-4 to even the series again. All that said, Ruff was a master of having a team ready in the playoffs as the Sabres were 14-4 in Game 1s under him during their postseason appearances from 1998-2011. It was quite a first three days of the playoffs this year. The Lightning, Penguins and Jets all fell into 2-0 holes as the Blue Jackets, Islanders and Blues all took control. Another example of why not getting to the postseason for eight straight years is a massive fail by the Sabres. You just never know what can happen once you get in. • Speaking of the Lightning, coach Jon Cooper said they now have a "five-alarm fire" on their hands after losing the first two games at home against Columbus. Tampa Bay now clearly needs to mimic what Washington did last year in losing the first two games at home to the Blue Jackets and then rallying to win four straight and advance to take the Stanley Cup. But the Lightning's early hole is part of a troubling trend. For all their talent, resulting in the most wins in the NHL over the last six seasons, the Bolts have only reached the Cup final once. That came in 2015, when they lost to Chicago in six games. Tampa Bay's playoff record in that stretch heading into Game 3 Sunday in Columbus is just 36-31. • We all got snookered by the Lightning's 62 wins in the regular season. They had given up 39 goals in their last 12 games, but managed to finish the season 9-3. But in the playoffs, where the ice is tighter and there are fewer power plays, that's generally not the recipe for success. • Connor McDavid's injury on the last night of the season was to the posterior cruciate ligament in his knee but will only require rest and rehab and no surgery, TSN said Saturday in response to the Oilers' statement that McDavid was starting a rehab program. McDavid will thus not play in the World Championships for Team Canada but should be ready for training camp. • A pair of Western New York products were named AHL second-team all-stars on Thursday. Toronto center Chris Mueller (West Seneca) and Charlotte right winger Andrew Poturalski (Williamsville) will both be heading to the playoffs. Mueller, 33, entered the weekend with a team- and career-high 33 goals and 65 points in 59 games while Poturalski, 25, had 23 goals and a team-high 70 points in 72 games.